Allright. Seeing as how I no longer have the ability to get feed back from peers and classmates, it's high time for my own reflection and self-critique about the Jack piece. My goal for the piece was to really start exploring my own style, and how I would like to draw upon artists whose work I admire and reinvent my own style (some artists I had in mind were Brett Helquist, Mary Grand-Pre, Linda Wingerter, and Alison Jay, for everything from stylization to whimsy, to color) while at the same time draw upon classic stories and fairy tales. Basically I asked myself, "How do I want my Jack to look? What does my beanstalk look like? What sort of colors do I want to paint?" My secondary goal was to continue to work on cold-press illustration board with acrylic, and consider the under painting a bit more than I have been. With that I made my sketch straight from my imagination. Yes, I know. I only made one sketch. (I should have made multiple thumbnails and challenged myself to see how I could strengthen my composition, but alas. ) But at that point, I felt satisfied. So I took my sketch into Photoshop, laid in the colors, and printed it out. I made a pretty through drawing on the board, and then did a flat underpainting of different colors. For Jack, the beanstalk, and the ground, I used a very intense orange, so as to connect them all thematically. (Both Jack and the stalk are tied to the earth from which they came). The trees were painted a dark magenta, the clouds a lighter magenta, and the sky was left bare. Then I painted. For a long time. 1. I like the clouds. At first, they were a very overwhelming almost graphic object in the painting, but I'm happy with the decisions I made in painting them back. It really seemed to give the whole painting more space. I also like the creamy colors rather than the pinkish ones I began with. 2. I like that I tried something new. I like my characterization of Jack, and I think if I keep pushing myself, I'll fall into a befitting style. 3. I like the overall color scheme. It feels different than anything I've done, and cohesive. I like the way it makes me feel when I see it. 1. I definitely wish I had let the vibrant under painting show through more. I need to remember the delicate balance between clarifying and over working. 2. Even though I'm glad I tried it, I don't think I would so much outline the beanstalk and Jack with so uniform line weight as I did. I had to try it, but I don't really think it's helping. 3. I wish I had done a tonal under painting, and really worked our my darks and lights before getting right to the color. More planning in the beginning stages would have saved me from overworking the paint down the line. So there it is. May it stand as a reminder to me as I move on to bigger and better things. Please do leave feedback of your own, as it would be tremendously helpful. Hey! nice piece. I like the clouds a lot. they make me wish more of the painting had that quality to it. I agree about the outline, I don't think I hate it but I don't love it either. I think you should probably go without it or give it a lot more variation. I think the trees in the foreground seem awfully close (large) and are making jack seem not quite as high up as he is. Most, I would like to see more specifics in certain areas. More drawing behind the painting. folds in the shirt/sweater, serious root structures and plant craziness at the base of the stalk, etc. I don't know if that fits in with the style you were going for, but I think that's what I would do. Nice to see your new work! I really like this piece! I'm going to have to disagree with Bob. Even though the clouds stray towards the realistic I don't think there is any need to pull the rest of the painting that way. If you went that root you would not only get into wrinkles and vines but also into a realistic manner of climbing/gripping the plant. I love that Jack is sort of floating atached by his elbow. It makes sense in a child's world. Childrens books are best with then exist in a different reality of gravity and every other law you can think of. You're striking a really nice balance between interest and simple shapes. I think you should keep pushing the outlines of the plant (not on this piece. This piece is done. In the future) and the pattern of the quilt-like hills. Your work has been looking really polished for a while so I would suggest that you think about what it is that you really enjoy doing with a piece that usualy gets in the way or trips you up, then just run with it, even if it crashes and burns. What little tiny part of this piece secretly pleases you? Don't be afraid of veering away from what feels polished and solid. I think you'll find something that stamps the paintings "Courtney". You know what I mean? Nice work! The mood/colors are solid. Its tough to crit work this good but I'll give it a try. I love this piece. I love the stylization that you are playing with, and I love your colors. 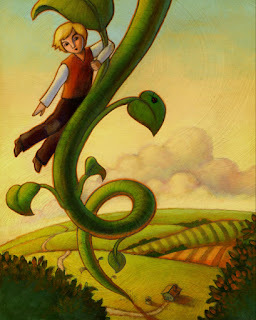 I don't mind the outline around the beanstalk at all, in fact I rather like it. I think the outline in your pinnochio piece gets to be a little stiff, but I think it works here. My favorite thing about this painting is the rich reds in the shadows of the bean stalk and bushes, you should continue to play around with complimentary colors. My only criticism is that Jack's elbow looks more like a piece of paper folded over the stalk than an elbow. 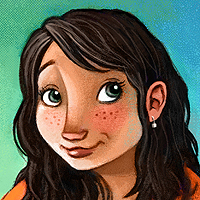 I understand you're not going to anatomic acuracy, but even within your stylized world it doesn't look like an elbow. Overall I love it. I love the orange outline, but I agree with you that it could have varied in its weight. I also like the light sweeping texture throughout the sky and fields -- it gives a great sense of movement. What I like the MOST is probably the color scheme; it is rich, unusual, and really pleasing, much like fairy tales themselves. I think that is the greatest success of the piece, by far. I don't really love Jack, to be honest. I like his costume and color scheme, but he seems so stiff and lifeless (almost doll-like) compared to the pulsating vigor of the vine, sky, and fields. But I do really admire it in general. Keep up the great work.